Candy Addict » Free Reese’s T-shirt has arrived! Free Reese’s T-shirt has arrived! 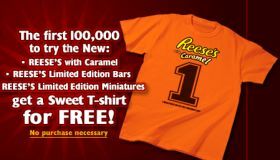 Two months ago I wrote about a “contest” Reese’s was having and giving away 100,000 Reese’s T-shirts. I pretty much guaranteed that you would get a free t-shirt if you signed up (sign up ends today). TodayI received my free Reese’s T-shirt! WooHoo! Anyone else sign up for it and get one too? You can’t beat free stuff, can you? So, now I have three candy-related t-shirts: my Nerd shirt, a Diablo t-shirt, and now my Reese’s shirt. You would think a Candy Addict might have more, but that’s it. There are plenty of other candy t-shirts I would love to have though. I got my shirt yesturday also! It was a nice surprise at the end of the long day!!!!!!! I got the Reese’s shirt too a while back.